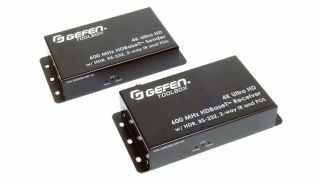 The What: Gefen is now shipping the GTB-UHD600-HBT and GTB-UHD600-HBTL, two new 4K Ultra HD extenders that can extend full-bandwidth HDMI 2.0 over the most widely used extension medium, category cabling. The What Else: The new extenders are capable of 4K Ultra HD 60Hz 4:4:4 (600MHz) extension. GTB-UHD600-HBT has an extension range up to 80 meters at 4K and 100 meters at 1080p, while the GTB-UHD600-HBTL is rated up to 40 meters at 4K and 60 meters at 1080p. Integral features of HDMI 2.0, such as HDR-10 and Dolby Vision, are also carried along the single Cat-5 or Cat-6 cable that links the sender and receiver units. Both products are capable of extending two-way IR. The GTB-UHD600-HBT also supports RS-232 extension for integration of control signals. Gefen’s proprietary Bi-Directional POL (Power over Link) sends power from sender to receiver or receiver to sender over the link cable, offering increased flexibility in choosing how each unit is powered. Additionally, integration with Gefen’s Syner-G software allows for easy firmware updates. “These new 4K Ultra HD extenders address one of the most significant issues that commercial installers face, and that is the extension of full-bandwidth HDMI 2.0 over category cabling—the most widely used extension medium,” said Gefen product manager Jason Fitzgerald.